I’ve been swimming a bit these days, as I have two majorly inflamed tendons in my right ankle that are limiting my workout options (and also making me VERY CRANKY). Despite knowing that it’s great, low-impact training and having grown up splashing in lake water from sunrise to sunset, I can only seem to get myself into the pool if I’m a) injured, b) pregnant, or c) training for a triathlon (there’s obviously no “D,” all of the above given these options). Squarely in category A and aspiring to get back into category C by summertime, the steady black line on the pool’s bottom is quickly becoming my training partner these days. 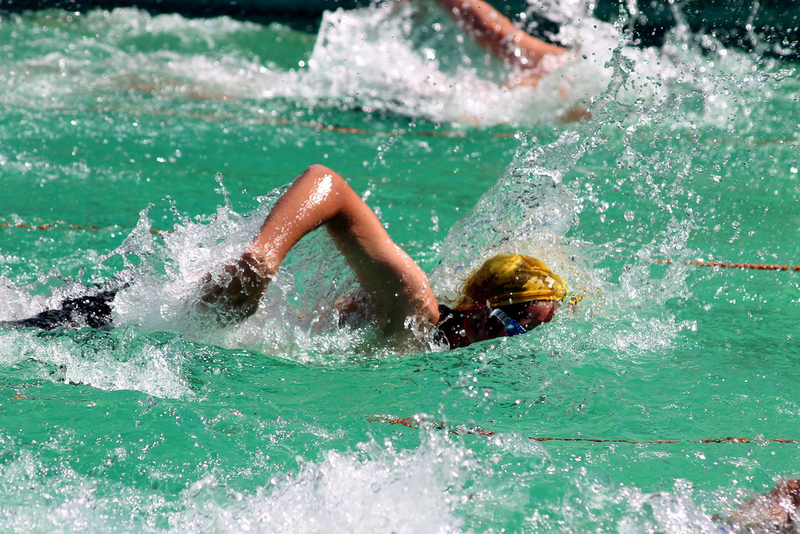 Although the act of swimming definitely feels more arduous than effortless for me, there is one thing I do really love about the sport: it’s an equalizer. Everyone (who has been taught to stay above water) can do it in some way, shape or form…and many people can do it for a long time….even a lifetime. My dad has been swimming a mile a day for more than 40 years, and he’s still going strong. At T-minus-three days and counting until our first child is due, I’ve been spending a lot of time in the swimming pool lately. And considering how everyone – old people, toddlers, college students, and even bored-looking lifeguards – seems to love a bulging pregnant belly, the art of making friends on the pool’s edge has been easy. Warm smiles and friendly banter greet me as I descend into the bliss of weightlessness at lunchtime every day, and in just a few short months, I’ve been able to learn a little bit about a lot of people’s families, jobs, passions, and daily routines. The diversity of the lunchtime swim crowd is amazing, as people of all shapes and sizes wearing brightly colored suits and caps convene to prepare for triathlons, shed a few pounds, rehab a bum hip, relieve the stress of the workday, or simply fulfill an element of their social calendars. In the pool, with white hair masked by swim caps and aching joints floating alongside sinewy muscles, age somehow seems to lose relevance. As I swim steady strokes in my lane, I love the mental image of my unborn son in the same pool as an art history major, a competitive triathlete, a retired professor, and a great, great grandmother of six. As our society approaches an imminent and dramatic demographic shift, I think often about what sort of country my son will grow up in. What sort of social problems will he set out to solve, and who will he look up to? How will he view his parents and his grandparents and his neighbors? For the optimist in me, many of these answers are found in the waves of the swimming pool. Handling this shift is about being able to co-exist with and learn from people representing a broad range of ages and backgrounds. It’s about not caring what color the hair is underneath the cap or what stroke the person in the next lane is doing. It’s about finding our collective strength. Oh, and a few endorphins never hurt. Are you a swimmer? If so, were you “born or made?” What keeps you coming back to the pool, and what’s your favorite swimming workout?